With EZ-Forms-EXPORT, creating completed, regulation export forms is easier than using a typewriter, much faster, and its a breeze to correct errors. Since you see your form and data on screen exactly as it will look on the printed page, a.k.a. (WYSIWYG ... what-you-see-is-what-you-get) you can quickly make changes before printing. No need to enter data multiple times. 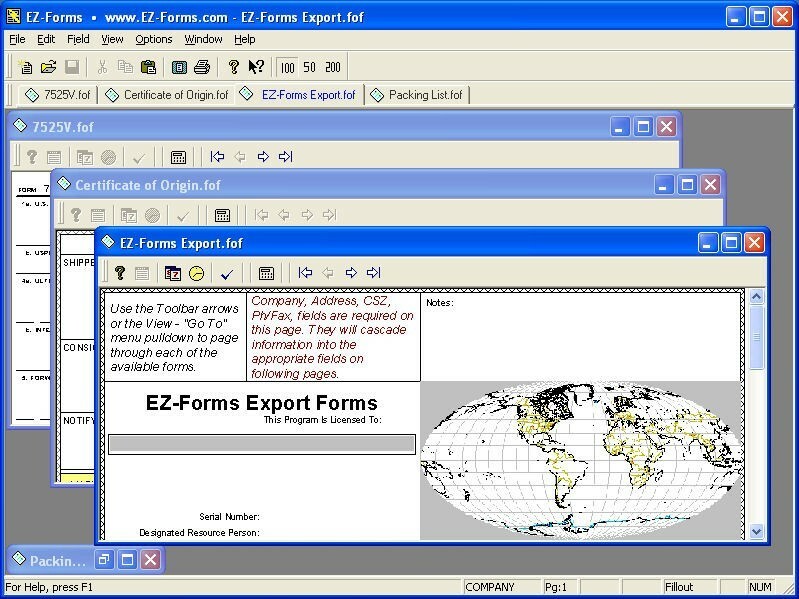 EZ-Forms-EXPORT works with almost any printer supported by Windows. Print as many forms as you wish when multiples are required. EZ-Forms-EXPORT is also DataBase enabled. This feature allows you to save all of your filled out export related forms in a searchable database for instant recall. You will be able to clone, add, delete, etc. all of your export forms quickly. EZ-Forms-EXPORT produces beautiful looking export related form. A good looking, professional and concise series of export forms conveys a feeling of confidence to the end user. In other words, "the supplier of this product has taken the time to provide information to me in a 'readable' format." Your embedded logo (including scanning) is available with single user, site/LAN licenses and above. Optional forms and customization are available. Go to: http://www.EZ-Forms.com/export for more info.